Dubai, May 11: Peter Lewis art exhibition was held on Tuesday 10 May 2011 at Hotel Move n Pick, Bur Dubai. Secretary to Indian embassy, UAE, Anuja Chakravarthy inaugurated the exhibition and declared open. The paintings of Peter Lewis hark back to early boyhood explorations of the countryside�s inherent magnificence. Later on his skills were recognized in the right perspective at the renowned Sir J J School of Art which honoured his achievement with a Gold Medal. 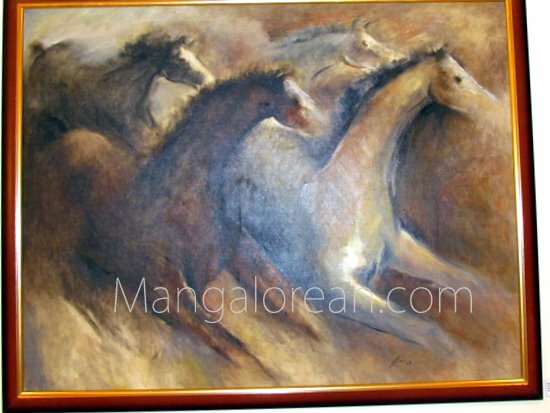 Awards and honours have accompanied his artistic evolution, of which those emanating from the State Lalit Kala Academy and the All India Dasara Art Exhibition stand out for their frequency. A Rajyotsava Award in 1990 and a Roerich Memorial Award in 1996 crown his endeavours. Other artists with roots in this land also derive inspiration from the scenic landscape and its diverse populace. The paintings have an implicit environmental message, the landscapes and seascapes convey beauty that is fragile and vulnerable to the imperatives of development and defence. Insights into tribal life have furnished the stimulus for aspects of Lewis� creative impulse. Coastal Karnataka has been a melting pot of faiths, and this is duly reflected in Lewis� work. Deep feeling and effort have been expended on the vast canvas 'The Life of Christ', wherein he seeks to propagate a message of peace and harmony. Many of Lewis� paintings evoke the genre of 19th-century French Impressionist Painters whose bold colours and fluid forms were a landmark in Western Art. Over the long course of a fruitful career, the public have had occasions to take in his offerings at prestigious galleries in India and abroad. One may infer that his work comes with a seasoned touch and mature perspective.